JAKARTA, Indonesia (CNN) -- Authorities investigating the twin hotel bombings in Jakarta have found the remains of another person and think a notorious Malaysian-born militant fugitive may be behind the assault, police said Saturday. 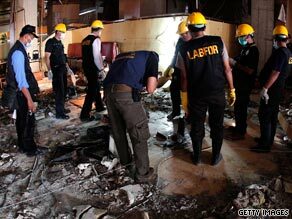 Police investigate the aftermath of a bomb blast at a restaurant in the Marriot hotel in Jakarta. The Friday bombings of the luxury J.W. Marriott and Ritz Carlton hotels killed at least nine people -- including at least two presumed suicide bombers -- and wounded more than 50 others. Indonesian police recovered a laptop that they believe belonged to one of the bombers, the country's official news agency said Sunday. The laptop, found in a room at the Ritz Carlton, contained information and codes that the attackers may have used to communicate with each other, the state-run ANTARA News agency said. Anti-terrorism officials are investigating the links between the attacks and Noordin M. Top, the suspected leader of a small Jemaah Islamiyah splinter group. The group has ties to Osama bin Laden's al Qaeda terrorist network, but so far no one has claimed responsibility for the attack. Top is reportedly an officer, recruiter, bombmaker, and trainer for Jemaah Islamiyah, which was involved in a previous attack on the Marriott -- in August 2003 -- as well as attacks on a Bali nightclub in 2003 and the Australian Embassy in Jakarta in 2004, according to the FBI. Indonesia's National Police Chief Gen. Bambang Hendarso has said the type of explosives found were similar to those found in a recent raid on a home in West Java that was linked to Top. He said the unexploded bomb was discovered on the 18th floor, where several suspects believed to be linked to the bombings were staying. Indonesian authorities have detained witnesses and others for questioning and have sent forensic evidence for testing, a spokesman for Indonesian President Susilo Bambang Yudhoyono said. The White House said that U.S. President Barack Obama spoke in a telephone call on Saturday with Yudhoyono. Obama expressed "support for and solidarity with his government and the people of Indonesia" and offered U.S. government backing for the "ongoing Indonesian investigation." He also lauded Yudhoyono for his re-election earlier this month. "The president noted that Indonesia's successful election on July 8 reminds the world that Islam, democracy, and diversity can coexist and thrive," the White House said. Fuentes said the FBI, which has an office in Indonesia, has offered assistance to investigators and it is likely the Indonesians will accept help enhancing security camera videos at the hotels. Closed-circuit television footage from the Marriott shows a man, wearing a baseball cap and pulling a wheeled suitcase, heading toward the Marriott hotel's lobby-level restaurant seconds before the deadly blast. Meanwhile, the remains of another person was found in the Jakarta hotel attacks, bringing the death toll to nine people, police said on Saturday. After the bombings on Friday, police found at least two headless corpses thought to be suicide attackers and at least six slain attack victims. Authorities on Saturday concluded another person died because they found a severed head that matches neither of the headless corpses. It is not known if that person was a hotel guest or one of the attackers. Police also said one of the headless corpses is a female. Four of the six attack victims were foreigners, according to the Health Ministry. The ministry identified two of the dead as Australian, one from New Zealand and one from Singapore. Another victim was Indonesian, and the sixth remained unidentified. Five of the victims and one of the presumed suicide bombers were killed at the Marriott, according to police spokesman Inspector General Nanan Soekarna. Minutes later, another suicide bomber struck the Ritz-Carlton, killing one person and another bomber. The bombings at the two luxury hotels -- which are connected by an underground tunnel -- happened shortly before 8 a.m. (9 p.m. Thursday ET). Both blasts struck the hotels' restaurants, and several prominent international business leaders were among the casualties. The hotels are frequented by international visitors and many foreign nationals. CNN's Kathy Quiano and Andy Saputra in Jakarta, Indonesia, contributed to this report.